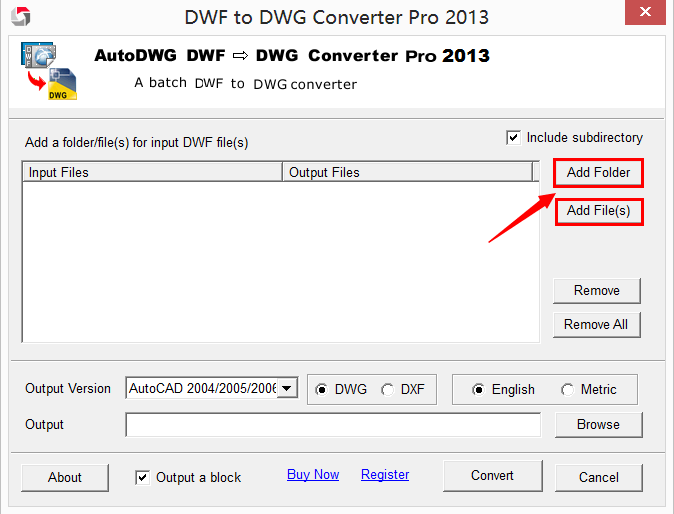 AutoDWG DWF to DWG Converter, Faster than ever! 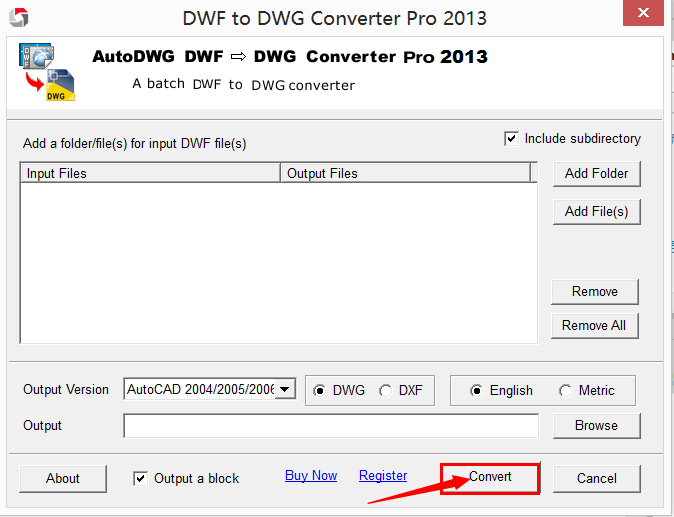 DWF to DWG converter helps you convert DWF to editable DWG file, supporting AutoCAD drawing R14-2019. Support new DWF v6.0 multi page specification. All DWF elements generated by AutoCAD Plot to DWF are supported, including True Type Font, ellipses, arcs and elliptical arcs. Layers saved in DWF will be recreated in DWG. Embedded images from DWF file can be extracted. DWG (from drawing) is a binary file format used for storing two- and three- dimensional design data and metadata. It is the native format for several CAD packages including AutoCAD and IntelliCAD (and its variants). In addition, DWG is supported non-natively by many other CAD applications. DWF (Design Web Format) is a secure file format developed by Autodesk for the efficient distribution and communication of rich design data to anyone who needs to view, review, or print design files. Because DWF files are highly compressed, they are smaller and faster to transmit than design files, without the overhead associated with complex CAD drawings (or the management of external links and dependencies). All DWF entity types exported by AutoCAD are supported, including arcs, elliptical arcs, ellipses, True Type Font, etc., so that you can retain DWF entities to correspond with DWG entities easily. For layers saved in DWF, the converter will read the information and recreate the layer in DWG, new DWF v6.0 multi page specification. This application is to convert a complete folder and even its subfolders of drawing files, and process in one go. It is high performing and easy to use. 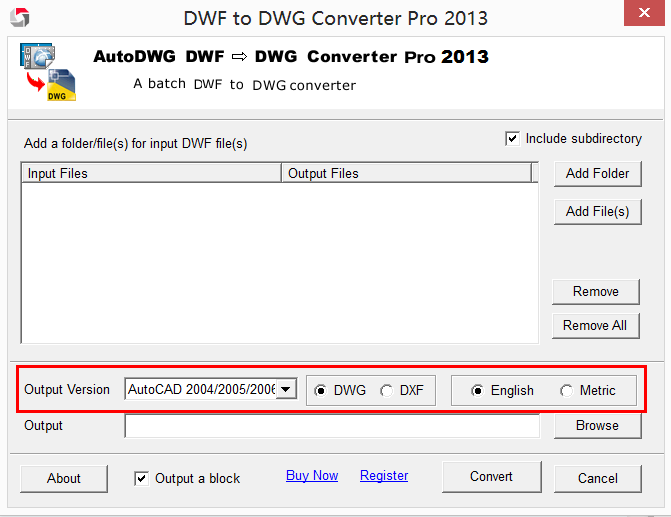 The latest version of this DWF to DWG Converter 2019 has been released recently. 1. Which version is your best choice? The plug-in version DWFin requires full version of 32 bit AutoCAD 2012 or earlier version installed on your computer. If you do not have a AutoCAD, the stand-alone Pro version is your choice! AutoCAD add-in enables you to import DWF file to AutoCAD, supports AutoCAD version from R14-2012 (32-bit version only). Please wait a moment when the program is processing. Then you’ll get nice and editable converted drawing files. The Pro version converter is a stand-alone application to batch convert DWF files to DWF/DXF files in a few steps, AutoCAD version from R2.5 to 2019 is supported. Step 2: Please select the version, format (DWG/DXF) and unit (imperial/metric) of output file. Can your program convert .dwfx file? I can't save dwg, how to do? Can you help me convert one file for the trial? You do not have to install program on your machine, just email your DWF file to us and we will run the program and then email the converted dwg/dxf file back to you, please provide your order ID and the original file(s), then we will email you back as soon as we can. A lite and fast dwg viewer, browse, view, redline, print DWG, DXF, DWF files.